← Charles E. Hanson, Esq. Company: Law Office of Sheldon L. Miller, P.C. 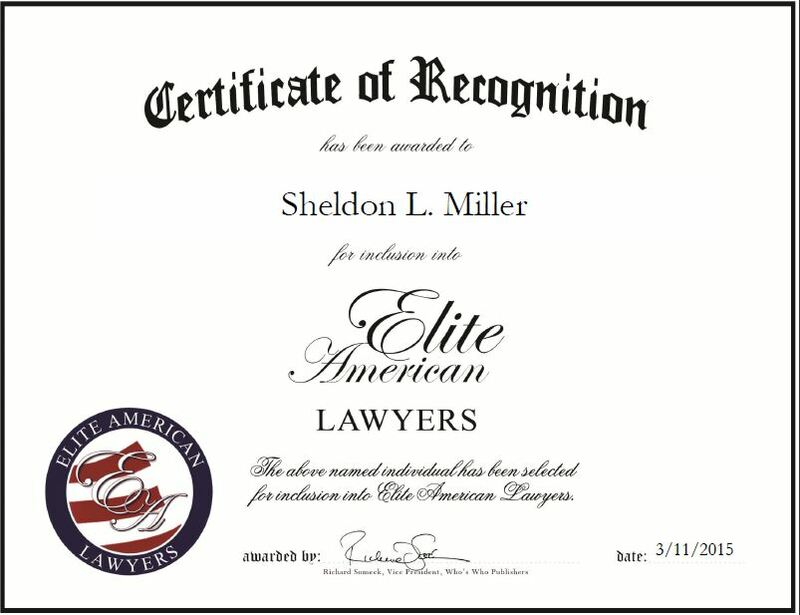 Farmington Hills, MI, March 11, 2015, Sheldon L. Miller, Attorney at Law at the Law Office of Sheldon L. Miller, P.C., has been recognized by Elite American Lawyers for dedication, achievement and leadership in personal injury and medical malpractice. Mr. Miller, who has been a practicing attorney for 53 years, established his firm 30 years ago. He has garnered a stellar reputation in the Michigan area and is viewed as one of the state’s top litigators and expert counsel. He pioneered the idea of mediation in his state and has helped countless clients with their legal issues. Mr. Miller is dedicated to fighting injustice and has focused his practice on protecting the rights of others and getting them fair compensation. Mr. Miller has gained extensive experience at both the state and federal level. Throughout his career he testified before Congress and introduced the idea of pure comparative negligence to Michigan. Mr. Miller’s contributions to the legal industry don’t end outside of the courtroom. He also founded Trial Lawyers for Public Justice, and mentored aspiring lawyers. Aside from his work at the firm, Mr. Miller stays active in the legal community through teaching. He lectures at events and seminars, teaches trial practice as an adjunct professor and has authored multiple articles. A role model and upstanding lawyer, Mr. Miller was profiled in “The Million Dollar Lawyers” and “Detroit’s Powers and Personalities,” and he was rated as one of the top tort litigators in the United States by the New York Law Journal. Additionally, he received the Mel Bellai Award in 2014, and the Champion of Justice Award from the American Trial Lawyers Association. This entry was posted in Personal Injury and tagged fighting injustice, litigator, mediation, medical malpractice, pioneer, protecting rights. Bookmark the permalink.